I don’t know exactly this Ayam Suwir Pedas originally came from. But there is a similar dish in Bali which is called ‘Ayam Suwir Bali‘. Anyway, as its name, this recipe is only for people who like spicy food. I made it mild since my husband can’t eat a very spicy food. For better combination, I served it with nasi putih (plain rice) and Vegetables Stir Fry (Oseng-oseng Sayur), and prawn crackers (krupuk udang). 1. Bring to boil the chicken. When it cooked, take out from the stock then shred the meat. Set aside. 3. Heat the oil, then sauté the spice paste until fragrant. 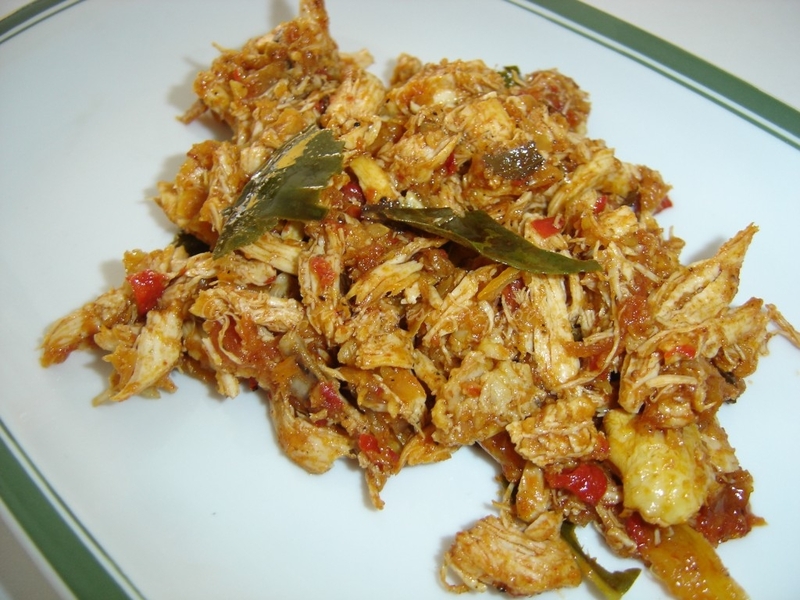 Then add salam leaves, kaffir lime leaves, lemongrass, fresh tomato,tamarind juice and the chicken. Mix them well for few minutes, and then give the chicken stock. Cook until the water absorbed. Add sugar or salt to adjust the taste.